M: Are you going to watch YouTube videos tonight? T: I don't know. What are you doing? 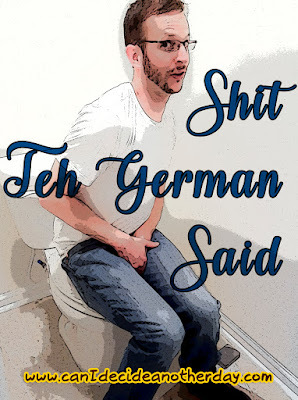 M: Well, I need to shower and go business and I thought about starting a new show called Parks and Recreation tonight, but I need to watch at least 3 episodes and I just don't think we'll have time because I'm going to take a "Teh German" amount of time in the bathroom. T: Yeah. I understand. I'll watch my videos. T (watching a snowboarder video): This guy is crazy doing all the tricks. M: Teh Running Bestie knows all about celebrities and you know all about the popular snow sport people and I'm over here like, "Did you see that thing on Facebook with the dog?" T: Or memes on Facebook. Did you see that new meme? T: Anyways, you know all about dogs and Disney. M: At least I bring something to the table. T: You always bring something to the table. M (singing Mulan tunes): "Now I really wish that I knew how to swimmm!" T: I'm not a Little Mermaid. M: That was from Mulan. T: It's always about the mermaid. M: Don't close that, I'm going back out there. T: You can close doors? M: And I can shatter glass ceilings. I just don't do it when you're around so I don't scare you off. T: Like with your singing? M: Do you have any suggestions about what to eat for dinner this week? T: What about white sauce spaghetti? M: Uhh... what is... Ohhhh, you mean alfredo. T: Yeah, white sauce spaghetti. M: Teh PT Child is coming by for his pennies. We're going to be penniless. T: But Penney arrives on Thursday. M: Then we'll be Penney-ful. T: Way better than being pitiful. While outside around the fire, we notice Meri playing with something in the yard and realize it was a frog. I ask Teh German to go get the shovel to toss the frog over the fence. He does and is successful. T: That was his highest jump ever. M: Teh German needs a lot of room with his football field length arm span. T: I'm an eagle, I need my freedom. HAhaha I will now only refer to alfredo as white sauce spaghetti! I was legit like "ooo what is this white sauce spaghetti? It sounds like it has potential to be amazing! I wonder if Megan will share the recipe? Oh! Alfredo...that does make sense..."